This is an archived Argonne News Release Item. ARGONNE, Ill. (Nov. 13, 1996) — How small is "small"? A particle that barely exists, as humans measure existence, is so remarkably small that trillions pass through our bodies every second with no effect. That particle is the neutrino, and it could pass through a chunk of lead thicker than the Earth as easily as a person walks through fog. The history of the neutrino and the history of Argonne National Laboratory long have been intertwined. The legendary physicist Enrico Fermi, who was the first director of the organization that eventually became Argonne National Laboratory, "invented" the neutrino in the 1930s to account for an atomic energy imbalance. He never actually saw physical evidence of a neutrino, and he expected that no one ever would. That expectation marked one of the few times Fermi was wrong. 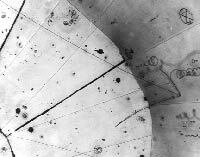 HISTORICAL NEUTRINO — The world's first neutrino observation in a hydrogen bubble chamber. It was found Nov. 13, 1970, on this photograph from the Zero Gradient Synchrotron's 12-foot bubble chamber. The invisible neutrino strikes a proton where three particle tracks originate (lower right). The neutrino turns into a mu-meson, the long center track (extending up and left). The short track is the proton. The third track (extending down and left) is a pi-meson created by the collision. Fermi and other scientists studying a form of radioactivity in which a neutron decays into a proton and an electron calculated that the combined energy of the proton and electron was less than that of the original neutron. To balance the energy equation a third particle was needed, and so the neutrino was "born." To explain why this mysterious particle had never been detected, the scientists theorized that it had no charge, no mass, and thus could pass through any object -- detectors included -- without interacting with anything. Neutrinos, they decided, were inherently undetectable. But the neutrino's existence was proven in the 1950s and the little particle quickly became an element of what physicists call "the standard model," science's current dominant theory of matter and energy. And in 1970, Argonne scientists saw evidence that Fermi had been wrong when they observed a neutrino's tracks in a hydrogen bubble chamber. In fairness to Fermi, the device that permitted the neutrino observation -- Argonne's Zero Gradient Synchrotron (ZGS), a 12.5-billion-electron-volt particle accelerator featuring a 12-foot hydrogen bubble chamber surrounded by a 107-ton superconducting magnet -- was almost certainly beyond even his vision in the 1930s. Superconductors, materials that lose all resistance to electricity when cooled to near absolute zero, allow construction of efficient electromagnets that use far less energy and create more powerful magnetic fields than larger, heavier magnets that use conventional materials. Today, neutrinos continue to occupy the attention of Argonne scientists. An Argonne team is readying an experiment that could prove that neutrinos do have mass. If they do, and because there are so many neutrinos in the universe, it might turn out that the little particle no one thought could be detected actually accounts for much of the mass of the universe -- more than all the stars and planets combined. That experiment currently is scheduled to get under way in 2001.